I cannot believe that another month has been and gone. I swear yesterday it was Christmas and now we’ve rolled around to April Fools day and my baby sister’s 19th birthday! March has been a funny one for me, I had to unfortunately take a bit of time off of work to just get me back to me and even though it was a lovely break, it shouldn’t have been needed and threw me out a little bit. Who knew contraception could have such a massive impact on your life in negative ways? However, I’m back on track now though (minus having a mini car accident and having to fork out almost a grand to get it fixed) and am really looking forward to (finally) seeing a change in the weather and getting my summer on! Here are some of my favourites through March! Now I’m afraid that for this one I couldn’t find a direct link to a VS website – unfortunately they currently don’t have a UK website and so I had to link you to Amazon, but I think it’s a bit cheaper on there anyway! I have absolutely fallen in love with this body mist since buying it at Christmas when up in Leeds and I cannot describe to you how amazing it smells (sorry!). It’s honestly such a gorgeous sweet scent; it kind of smells like a melon and floral mix which sounds a bit odd, but believe me it is gorgeous! I bought three fragrance mists in total (I think they were on a 3 for £25 offer) and this one is by far my favourite. It’s really light and not too over powering, perfect for a pick me up or a long lasting spritz in the morning! Although it has quite a steep price tag for what it is, I’d definitely recommend this over a lot of expensive perfumes any day! I think most of you will know that my hair is incredibly long; I think that at the moment it currently falls to the bottom of my back / top of my bum and I hate for it to be cut or broken. I can be incredibly protective over my hair and spend lots of money each month restoring it to it’s natural healthy state. Because my hair is quite long it’s quite difficult to style of a morning for work and so I usually end up slinging it into a ponytail or a messy bun, this month I have found my Invisibobble to be an absolute life saver. It is so easy to use and stretches lots with great grip to ensure that my hair is kept in it’s style all day long, especially when I’m at the gym, it’s brilliant at keep my hair up and out of the way! For £4.28 some people think that these can be quite expensive, but for a pack of three I think this is such a great price. They haven’t broken on me yet (no matter how much I stretch them) and my hair has broken so much less since using them! I’ve mentioned this a little in my next post, but basically this book is perfect for a blogger like me who sometimes gets completely stuck for blog post ideas. 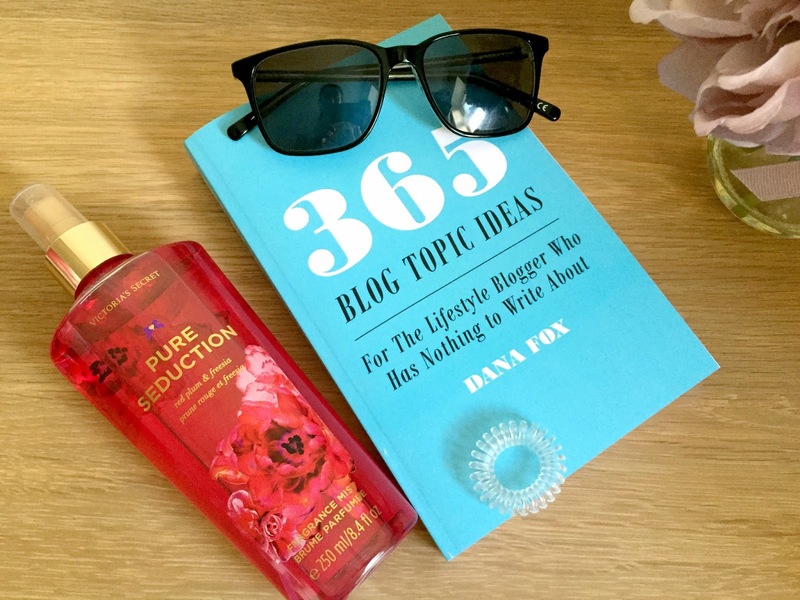 This book is written by fellow blogger Dana Fox (AKA Wonderforest) and it has 365 pages of blog topic ideas that are there to influence our creative brains and to help us think of new blog posts. It’s written in single phrases (sometimes even single words) to give us the nudge that we need to think of something new to write – I managed to flick through and look at the same page 3 times and think of 4 separate different ideas! 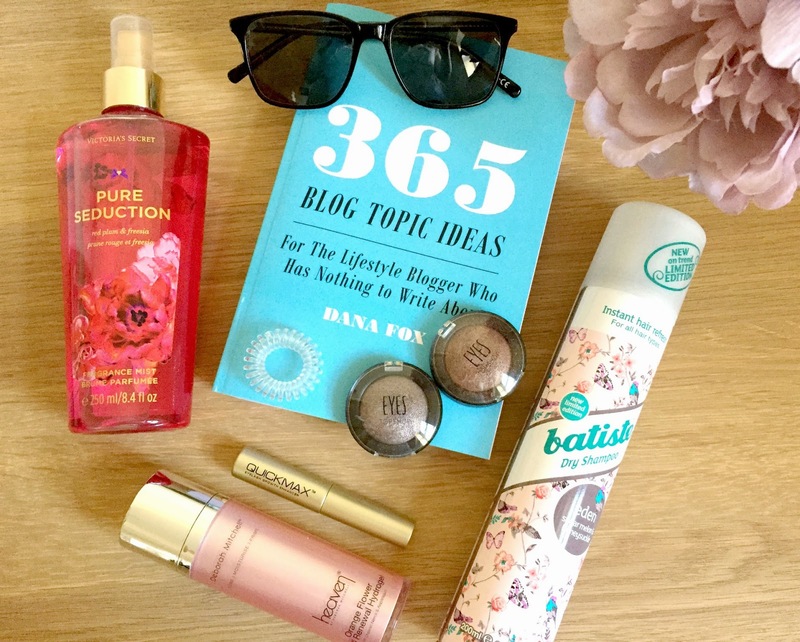 Although it’s aimed more so at lifestyle bloggers, as a beauty blogger myself, I’ve found it really helpful! Now that the sun is slowly starting to show itself I’ve been getting a whole lot more use out of my gorgeous London Retro Highgate Sunglasses. I first reviewed these here, so make sure you catch up on what I wrote in my original review, but I really have been loving these more this month. The classic black look is perfect for my every day work looks and also go really well with a more girly, spring time look for the weekend. For a black pair of sunglasses this is unusual and I really think that London Retro have gotten the style SO right with these! Since posting my first Topshop Beauty review here, I’ve been playing around with the two eye shadows I purchased a lot more. I have been absolutely loving Galaxy and Interstellar in the month of March and have been wearing them almost religiously on a daily basis. I first use Galaxy with my MAC 217 along my crease and then press Interstellar into the outer corners of my eyes with my Real Techniques Shading brush. 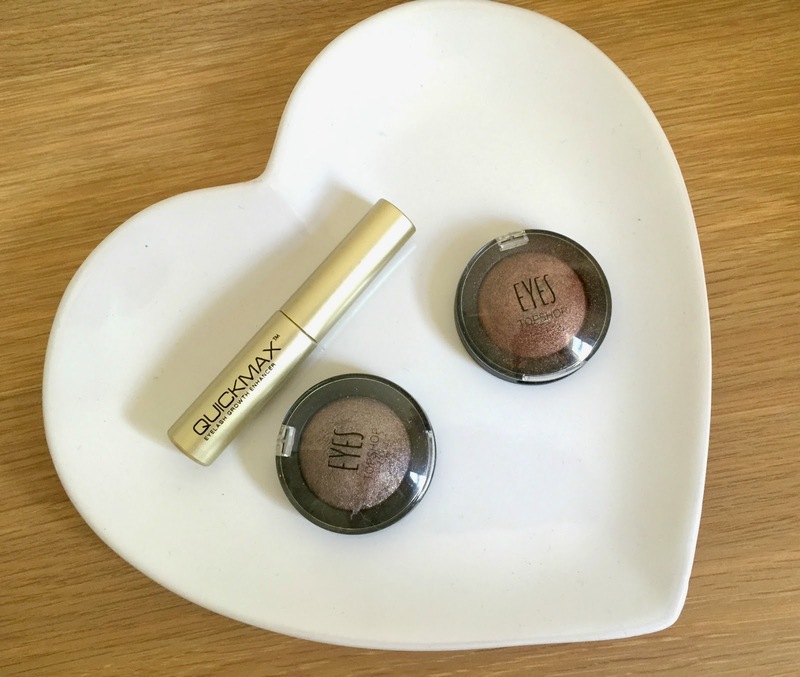 It’s such a lovely smokey eye and perfect for work – even better for a night out with a little more intensity, some black eyeliner and my fave mascara! Quickmax is a liquid eyelash and eyebrow serum that comes with a thin applicator brush to apply to the brows and lash line like you would any eyeliner / brow product. I’ve tried this product over the last few weeks, applying it to my upper lash line every night before I go to bed. I was a little sceptical at first having tried products like this before, but I have definitely seen a difference in the length of my lashes since using this. Within around two weeks I noticed my lashes had become fuller and a little longer than they were before and I was really impressed! I’d definitely recommend this, especially since the bottle seems to be everlasting! I’ve used this for about a month now and still have way over 3/4 of the bottle full. My next step is to try this on filling out my brows – I can’t wait to see the results from this! As always Batiste is still an ongoing favourite of mine! 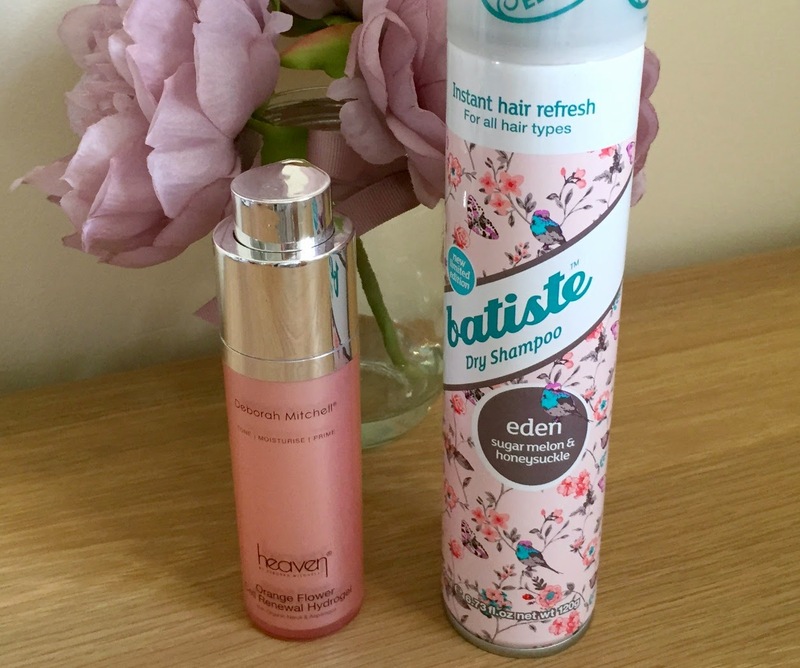 I’ve tried many dry shampoo’s in the past but I’ve always found myself going back to Batiste. Eden is the new fragranced dry shampoo from my favourite brand, it’s a really light and uplifting scent and perfect for the spring time. This latest addition to the range is a mixture of Melon and honeysuckle scents and is part of their new formulation for a longer lasting scent and freshness. Eden is only available within Superdrug stores at the moment so keep an eye out where you can because I definitely think this has over taken Cherry as my new favourite scent! I was recently sent this ‘Hydrogel’ and honestly I didn’t know what it was when I first received it, but after doing a little research I found out that this was a toner that did ‘much more’. As suggested by the Heaven Skincare website, I started using this as my evening toner and then as my morning primer and with it’s anti-aeging and cell-renewal properties I have really noticed a difference in my skin since using this. I’ve began using this daily on a cotton pad and sadly am now running out (cry) but I really have enjoyed using this (and no, not just because I was sent this for review), I’ve seen a dramatic difference within the reduction of my spot scars and have felt my skin tone up a little (if that’s even possible). I really have been loving this Hydrogel and am ready to place a second order for it! It’s nice to have found a product that is a 2-in-1 that actually seems to be working for me. I know a lot of this months favourites have been sent to me for review, but you know me, if I really don’t like something, I’m not afraid to speak my mind. These products are in my monthly favourites because I really do love them and they have been my favourites from this past month! What have your march favourites been? Let me know in the comments or link me to your monthly favourites so that I can get my wish lists built! I really need that book because I get stuck quite often! That book sounds great and the sunglasses are gorgeous. I love the sound of that Batiste scent, I need to try some new ones out, I always buy the same one. That book looks really useful, great for inspiration. All of your favourites look so good, I think I might pick up that book of blog post ideas I have wanted it for quite a while!